"Happens all the time in my business… People just seep, vanish." 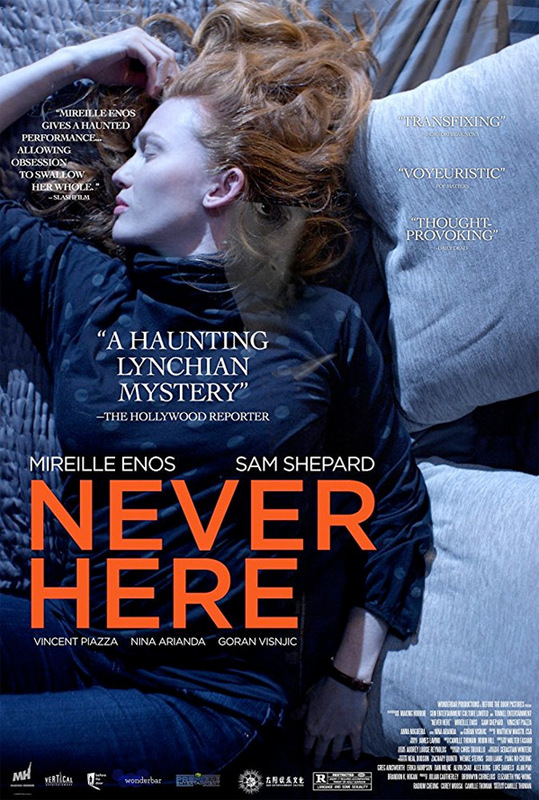 Vertical Entertainment has debuted the first trailer for a dark thriller titled Never Here, formerly You Were Never Here; not to be confused with Lynn Ramsay's You Were Never Really Here (which is a fantastic film). From director Camille Thoman, the film is about an installation artist who follows and photographs strangers for her art, until disturbing events lead her to suspect that someone out there is watching her. Mireille Enos stars, along with the late, great Sam Shepard, plus Goran Visnjic, Vincent Piazza, Nina Arianda, Ana Nogueira. One of the quotes describes it as a "haunting Lynchian mystery" which seems quite accurate. This looks strange and confusing. Lines blur between real and imaginary, crime and art, the watcher and the watched in this eerie, genre-subverting exploration of identity. Installation artist Miranda Fall (actress Mireille Enos) follows and photographs strangers for her art until disturbing events lead her to suspect that someone out there is watching her… Never Here is both written and directed by English filmmaker Camille Thoman, of the documentary The Longest Game previously as well as a short film and editing work. This first premiered at the Los Angeles Film Festival this year, and it also played at the Chicago Film Festival. Vertical Ent. will release Thoman's Never Here in select theaters starting October 20th this fall. Anyone interested in this?